Years ago I was introduced to The Chinese Almanac (they were a client). This was a thin paperback published by Ginseng Press that provided information associated with the Chinese calendar system through yearly forecasts tied to projected weather patterns. Sadly, this book is now out of production (it was an annual publication akin to the Farmer’s Almanac but with a much deeper exploration of forecasts as they relate to eating and health). The content drew from the knowledge of a licensed naturopathic and registered Traditional Chinese Medical doctor with rare access and prolonged exposure to the elders passing down this ancient wisdom over a five thousand year period. Curiously, he now lives in Canada. One issue I became acutely aware of after reading these books was how much food choices can combat or contribute to health issues. Not in the way most are pushing now, but through the wisdom of simple, ancient teachings. It makes so much sense to view local seasonal foods as the best choice provided you see the world as connected in a way suggested by Eastern philosophies. The things I learned (and experienced through testing) were priceless relative to food choices according the weather (and ailments). Now I understand why my body rejects oranges in the winter, what foods are cooling or heating (they’re not what you might think), the benefit of focusing menu plans on what I can grab from the garden and how certain items can have a huge effect on seasonal health concerns. If you’re interested in how food choices affect your body, it’s worth taking the time to do a little research and study on the ideals offered through ancient Chinese medicine. You might be amazed at how quickly you can improve how you feel by drawing from what’s naturally available during different times of the year. It might even provide additional incentive to buy from local farmers – a practice that does so many good things for you and the community. That said, sometimes it gets challenging finding fun, quick and different recipes for abundant local foods. 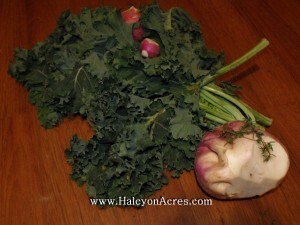 Kale and turnips are in season at Halcyon Acres® right now in copious supply. Kale is loaded with beta carotene, vitamin K, vitamin C, lutein (antioxidant) and even offers a decent dose of calcium. Turnips (roots – the greens carry a lot more nutrients) give a boost of Vitamin C as cooler temperatures start bringing on colds. At less than 40 calories a piece, turnips provide a nice boost of interesting flavor to meals when you’re looking for a different taste. It’s always challenging with uncommon or abundant foods to find different ways to prepare them. Here’s an easy recipe that includes kale, turnips, garlic, thyme, stock and a little bit of oil that takes less than five minutes to prepare once the turnips are cooked. Do you have tasty recipes that could come from your own in-season garden (all food ingredients in this one came from the Halcyon Acres® garden today – even the little bit of organic sunflower oil is from a local producer manufacturing now)? We’re looking for quick and easy ideas to include in our recipes section on this blog. Have one you’d like to see featured (of course we’ll give you credit and are happy to provide a website or blog link as part of this) on this site? Please share. You can do so in the comments below or e-mail NLevin@HorseSenseAndCents.com. Thanks for sharing! Nanette, the idea of eating seasonally is a very important one, and one that most never get around to exploring. Thank you for raising this important point. I got interested in Chinese medicine through the practice of energy therapies, especially Jin Shin Jyutsu, and I have found that many of the principles of Traditional Chinese Medicine apply clearly to my British genome body. Perhaps others would find this is true for them. Thanks so much for stopping in, Kebba. Your knowledge of TCM is probably much more extensive than mine, but I am fascinated with the continued learning process and all it has to offer as natural alternatives. Hello! Just dropping in from balomsimma’s blog hop. 🙂 The fresh produce you incorporate leaps off the page — beautiful photography!We don’t have a CSA supplier here (that I know of), but there’s a Farmer’s Market once a week that’s up and running now. Will be checking back with you for more ideas! When we moved to the South, I was amazed to see “greens” in the market — (uncommon “up north”) — I’m glad to live where there’s an abundant supply! Thanks for stopping in, Yunus. Yes, I’m missing greens here, but plan on setting up indoors for the winter to have a ready supply. Great article Nanette. The doctor probably lives in Canada because they welcome naturopathic doctors far more readily than the US. Many states don’t allow them to practice unless they are licenses chiropractors. Seasonal eating makes sense if you believe that nature provides everything we need. Many modern people don’t eat for their bodies, they eat for the taste or the emotions and have no real understanding about the relationship of food and our bodies. Your article is a good prompt that we should all learn more about this topic and try to feed our bodies what they need rather than what we think we have a taste for. I read something this week (probably from a fellow UBC participant – wish I could recall the source to quote and attribute as it was marvelously stated) that we should be thinking of food relative to how it helps our body function by being aware of how our intake makes us feel, perform, summon more energy, etc. The way this was expressed (I’m not doing it justice) really got me thinking. Of course, we’ve all heard the fuel you body and mind, you are what you eat, etc. and the scientific justifications for healthy eating, but this writer came at it from a different direction. In part this included keeping a journal to record how certain foods affected mood and performance during the day, but mostly it was suggesting a very interesting mind shift in a way I hadn’t heard stated before. Yes, I’ve read a lot that talks about the right attitude with food (and dismissed most of this – I really like to eat) but this made sense to me in a way I could apply it and still feel good about smart choices. I’m sure he’s in CA for the reasons you state. I just found it funny he wasn’t in China. there is no reason why soitmheng is a good medicine, just because it’s herbal, or simply because it is Chinese. the only way to show if soitmheng is a good medicine is through scientific testing, and the fact of the matter is, herbal supplements arn’t regulated by the FDA so long they no concrete demands, which they heal, they arn t need to actually existing Beweismittel.wenn your not going to feel good to see a real doctor and what you should do, or to feel better, not free to all natural herbal, drug, Pie in the sky junk instructed to leave things, the evidence for the assertions made. Hi Yukki – I appreciate your stopping in and taking the time to comment. There are a lot of different approaches to health. Exploring what others have discovered over thousands of years of study is worth considering. This blog post doesn’t talk about herbal supplements. Did you read it? How do we know what is considered in season when we live in the colder part of the country? Our garden is finished now. Hi Debbie, thanks for stopping in and commenting. Cold weather is tougher, but root vegetables are good for winter. I don’t know if this is ‘in-season’ or not, but I find lettuce grows well indoors during the colder months as do radishes. I am a fan of the turnip, however no many in my family feel the same way. If I use it in soups they are ok with them (I think they work their way around them)but if I make mashed turnips for dinner it will be pretty much my dish. I’m still not a big fan of kale but the more I learn about it, the more I want to add it to the menu. As for Debbie living i the colder part of the country, I think we need to do a little canning to cover those winter months when nothing is growing outside..Some herbs can be grown in the house all year. I have a very nice rosemary “tree” in the kitchen window. I would love to find copies of The Chinese Almanac to learn more. Thanks for checking out the blog and commenting, Chef William. I’ve found a 1/3 turnip to 2/3 potato mashed mix works fine for even the turnip naysayer :-). I’m not a big fan of kale either. I’ve tried some different things with it (the latest was a garlic, chicken stock, soy sauce mix) and still haven’t found a way to truly enjoy it (besides the turnip and kale referenced recipe). My next try may include a cheese sauce :-). It’s so healthy, I’d like to try to find a way to incorporate it into my diet with relish. I’ll let you know if I come up with a brilliant solution. By the way, I’ve really been enjoying your blog posts. I’ll probably incorporate some links back to you in future post. I just made this soup and it is delicious. The sweet poeotats really pair well with the turnips. I added some good olive oil at the end to finish the soup and some maple syrup to add a touch of sweetness and flavor. Lots of black pepper and bam! delicious soup. Creamy and satisfying with no cream! thanks! Sounds delicious, Thuany. I wouldn’t have considered pairing sweet potatoes with turnips in a soup. Great idea! I’ll have to give it a try.